1. Learn how to make this Breezy Tunic with a great tutorial from Elegance & Elephants. 2. My good friend Khadija from Creative Mind shows you how to make your own lovely necklaces, just like the ones at Anthropologie. 3.Erin over at Taking Time to Create always has the loveliest cards. 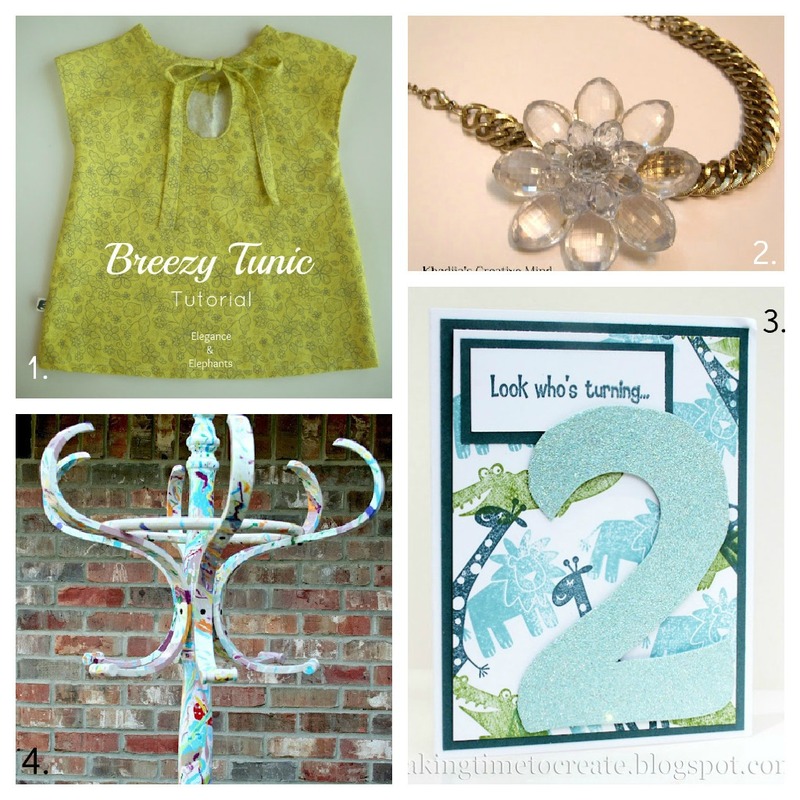 Check out her blog for loads of creative cardmaking ideas. 4. Here's another fun anthro knock-off. Jana from Transformations from the Heart saved herself $976 by making her own super cool coat rack. Stop by her blog to find out how to make your own. Thank you so much for the party! I linked up with my redesigned vintage dress pattern. Have a great evening! Happy Canada Day to you. I hope you had an enjoyable day. Thank you for hosting the linkup party! I linked up my crafting with the kiddos project and a hair bow tutorial. Happy Canada Day!! Have a wonderful celebration! Are you going to have any fireworks? And aslo thank you for hosting the party. Thank you so much for the feature. I am truly thrilled and honored! Thanks for hosting! Happy Independence Day! Thanks again for featuring my card! All linked up! Thanks for the invitation and I'm your newest follower now. Thank you for the invitation to your party! Have a great week! Make it Great Monday + Giveaway!